You can see that White's knights and king take away the c4, e4, d2 e2, and e3 squares from the Black king. If White's Queen is lured onto b2, it would deny Black's king the remaining squares around him, thus creating stalemate. 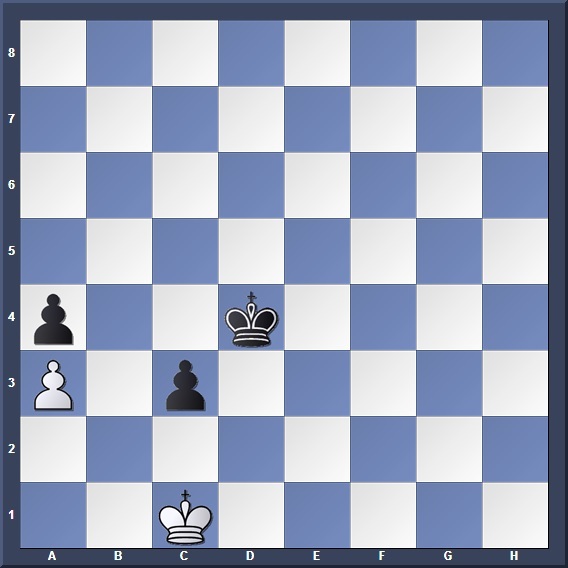 Black does this by throwing in a decoy: 1... Re2+ 2. Kd1 Rb2! (with the dual threat of Rxb8 and Rb1#) 3.. Qxb2 stalemate. 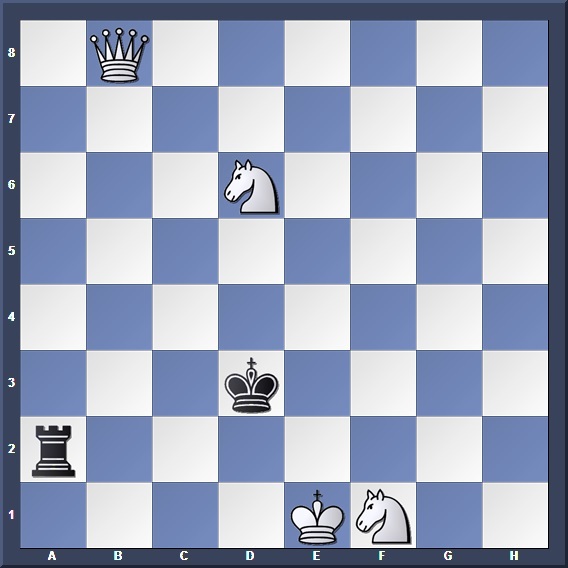 The first couple moves should be simple enough to figure out: 1. b7 Bb6 2. Nf5 and White wins the bishop. What happens afterwards is the tricky part! Not} 2. 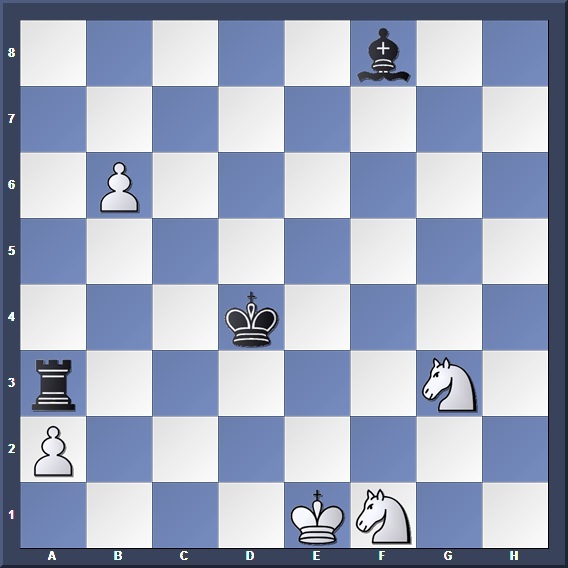 Nf5+? Kd3 3. b7 Bb4+ 4. Kd1 (4. Kf2 Bc5+ 5. Kf3 Ba7) 4... Rxa2 5. Kc1 Ba3+ with mate to follow. Removing the defender of the b8 square. And we reach the same position as our first puzzle! From there we already know that Black forces a draw with Re2+ 6. Kd1 Rb2! 7. 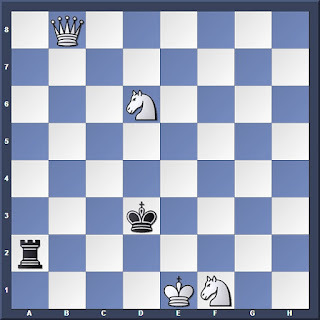 Qxb2 stalemate. If it were White to move, he would be in zugzwang: 1. 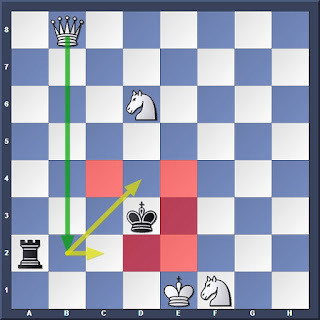 Kc2 Kc4 and White's king must give up the b3 square. Thus, Black needs to lose a tempo to get the same position with White to move. Or 3. Kc2 Kc4 4. Kc1 Kb3 winning. 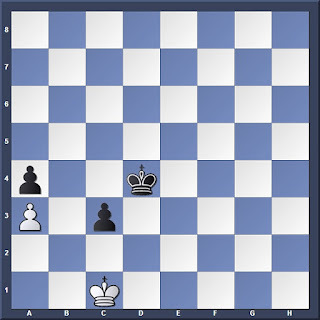 We have reached the original position but with White to move. Now White is in zugzwang. The a3 pawn falls and Black will promote his pawns.